There are things happening right here, right now, in Salt Lake City that have the potential to greatly impact my cause and the people I care about most. It begs the question why, as a proud representative of Salt Lake City’s most active climate justice group, I am climbing on a plane in half an hour to fly to a town in West Virginia to which I’ve never traveled, to give my voice to an issue that affects me only in the abstract, indirect ways that are easiest to ignore. Human beings have come to a point in the history of our overpopulated, information-saturated planet where we are simultaneously incredibly, immediately connected and achingly apart. We watch breaking news in real time as it occurs across the seas; we create and nourish intimate, if mechanical, relationships with total strangers from foreign climes; we hear eyewitness accounts of personal, unthinkable tragedy—and we can turn it off and walk away. There is only so much global devastation to which an ordinary person can authentically relate; after that, it becomes lip service and empty rhetoric. At the same time, certain issues cross boundaries and borders to unite us. To stop the staggering power of the fossil fuel industry, we must rally around those issues; the issues that reach down your throat and squeeze your human heart. Mountaintop removal is among them. If you’re anything like me, you likely know next to nothing about the brutal, unforgivable practice that is mountaintop removal. MTR is an issue that only recently has come aboveground and into the eye line of the public at large. MTR has been going on for decades, and it is absolutely, violently wrong. Everything about it—from the richly biodiverse mountains it literally detonates, to the irreplaceable and increasingly precious freshwater streams it buries, to the low-quality, filthy coal it unearths and dumps into our atmosphere, to the people and communities whose jobs, resources, bodies, and character it actively destroys—calls into question our collective conscience and humanity. I am a communitarian at heart; I believe that the best thing that you and yours can do for our movement is to put down roots, organize, and clean up your own backyard. I could apologize for the cost and the carbon I’m expending to travel to West Virginia; I could apologize for the distraction from the local issues to which Peaceful Uprising is committed first. But I won’t. During my brief, blessed time in Appalachia, I witnessed a fact that I already suspected: Appalachia is special. The march I’m attending—the March on Blair Mountain—commemorates one of the most remarkable moments in American Labor history, and in the history of American social justice in general. 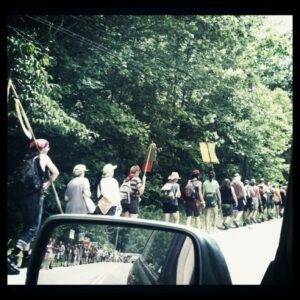 The organizers of the March on Blair Mountain recognize that theirs is a bitterly precious, unique, endangered heritage. Appalachia is not just the community America is sacrificing, lamb-on-the-altar style, in the name of cheap, convenient power and complacency. I recognized that Appalachians—then and now—embody and exemplify the very qualities—those rugged, stubborn, brave qualities—that make America. Appalachia is America, and every time we flip our lights on, we burn down another corner of her deepest sacred heart; a corner that won’t come back. The time has come and gone to stop mountaintop removal. At this point, it’s unforgivable to allow it—even if Appalachia seems like one of those quiet, distant places that are all too easy to set aside on a shelf in your mind. Stop doing that. Start thinking about it. And if you can’t come to Blair Mountain to march against mountaintop removal, figure out where your electricity is coming from. See “On Coal River” or “The Last Mountain.” Go for a hike on a nearby ridgeline with your kids or your dad, and think about how you would feel if you were Larry Gibson, or Maria Gunnoe, or Bo Webb. Think about what social justice, workers’ rights, and community character means to your life—and whether or not it’s worth a fight. 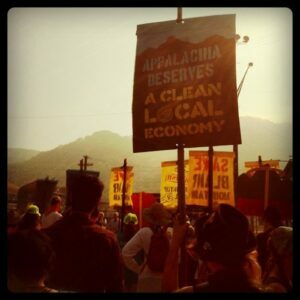 After all, if we continue to lay our brothers and sisters in Appalachia on the altar in the name of cheap, convenient energy, who knows which of us is next in line? Have you ever sit down to think of all the families that will be destroyed be doing away with MTR. We are a family of five. 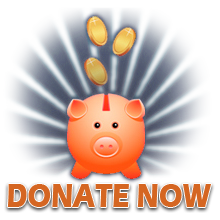 Three little children ages 12, 7, 3 have you thought of how we can raise them with the things they need without an income. Yes trees, plants, animals are wonderful but I DO NOT think more of them than the people this is going to effect what you are doing is not going to save the world cause there much more that needs to be fixed. Look at all the welfare and dope heads that take any thing they can, but the people you want to hurt is trying to do good and work for a living. TAKE THE TIME TO REMEMBER ALL THE FAMILIES YOU ARE TRYING TO DESTROY HOW IS THAT GOING TO HELP. Sherry, I really appreciate this comment. My inspiration of late has come not from political movement politics, but from communities like yours, where real needs might be actually met and addressed, with real solutions. I have given a lot of thought to why people are moved to support mountaintop removal mining, and having lived in West Virginia and east Kentucky since authoring this post, yes, I absolutely understand where you are coming from. I think, at this point, that it’s insane for anyone outside of Appalachia to dictate their solutions to MTR. If mountaintop removal mining was putting people to work instead of stripping good folks of their jobs and heritage, I would be in your corner. Such as it is, I think that MTR devastates communities like yours; the increasing trend in the mechanization of labor has painful and almost insurmountable effects on communities that depend on and take pride in the legacy-old tradition of deep mining. Sincerely: I would love to talk to you about this. Your opinion is priceless to me, and I would never support or take part in an action that puts communities like yours at risk. Thanks again for weighing in, and I hope to hear from you soon.